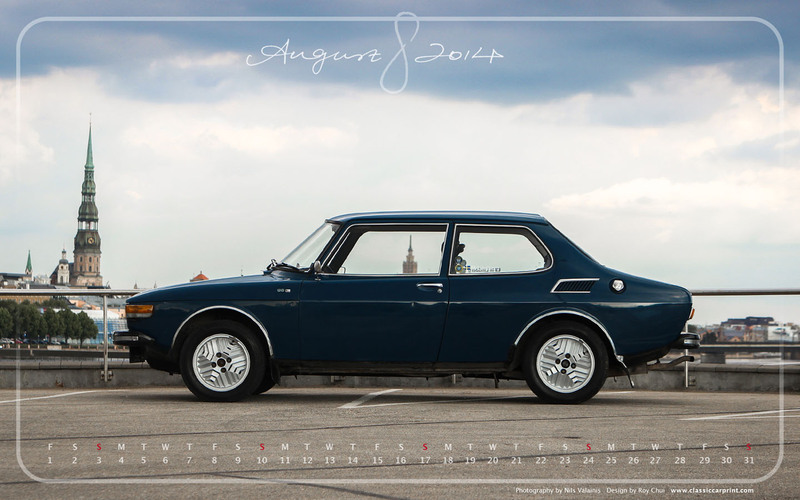 The Saab 99 made its United States debut in April 1969 at the New York motorshow. Powered by 80 horses kicking from its 1,709cc carburettor four-cylinder engine, the first model year was only available as a two-door saloon. The four-speed gearbox was controlled by a now floor-mounted gearstick. Model year colours were red, white, blue, green black and beige. An improved interior specification now boasted improved lighting, a clock, a cigar lighter and ashtrays in the rear. An improved three-point engine suspension system and and aluminised exhaust improved the specification elsewhere. A new 99E Automatic with Bosch electronic fuel injection, boosting the engine output to 87hp, was introduced. This was the first Saab to be equipped with a completely automatic (Borg-Warner type 35) gearbox. A four-door saloon version of the 99 was launched, together with the Saab Sonett III, on 13 April 1970. This 99 was the first Saab ever to have four doors and was available with a manual gearchange and carburretor engine or as a fuel-injected automatic. Polar White, Silversand, Toreador Red, Savannah Beige, Sea Green, Black and Medium Blue completed the colour line-up. The big safety innovation of the year was a headlamp wash-wipe system fitted as standard (on certain markets) for which Saab-Scania was awarded the Gold Medal by the Swedish Automobile Association. The vertically mounted wiper blades were powered by a common motor. Since water was sprayed simultaneously to the operation of the 40 strokes per second blades, the washer reservoir capacity was increased to three litres. Externally, the 1971 99 could be differentiated by the two rectangular grilles beneath the main grille. These were essential to improve cooling, especially on models fitted with the automatic gearbox. Internally, the rear view mirror was given an anti-glare attachment and the instruments were revised and mounted deep into a redesigned intrument panel. A new 1,854cc engine delivered 86hp, if fitted with a carburettor, or 95hp with electronic fuel injection. The 1.7 litre engine was now fitted with a manual gearbox, but the choice of an automatic was available on the 1.85 litre. The 1972 model was presented in August 1971 with innovations such as an electrically heated driver’s seat as standard and impact absorbing bumpers that reformed following an impact of up to 8kph (5mph). The 99 was now powered by either an 88hp 1.85 litre or a 97hp fuel injected engine, both with the option of automatic or manual gearboxes. The freewheel feature had now been withdrawn. External differences were larger indicator/parking light clusters on the front wings. For the United States market the 99 came equipped with four round headlamps since local regulations did not permit rectangular units. Consequently, Saab’s innovative headlamp wash-wipe system was not available in this market. The 99 EMS or Electronic Manual Special, made its first appearance in January 1972. Available only in Copper Coral metallic, this 99 had alloy wheels, leather steering wheel, halogen headlamps (not US), a tachometer and a new Swedish built 1,985cc engine with Bosch Jetronic fuel injection. The EMS delivered 110hp at 5500 revs and, with a 0-100kph time of 11.6 seconds and a top speed of 170kph, it was a sporty performer. The 1973 model year comprised the 99L – a low cost two door – with a 1.85 litre engine and the 1,985cc 99 EMS that had been introduced in the preceding model year. All other model variants had the two litre engine and two or four doors could be had with either auto or manual transmisson. In the United States the only engine offered was that with fuel injection. Saab’s 1973 safety innovation, that has since become industry standard, that was standard on all cars was side impact protection beams within the doors to help prevent intrusion into the passenger cell in the event of a collision. Further, the headlining was now compression moulded from shock absorbing glass fibre. All 99 models now had matt black grilles and halogen headlamps (except US) fitted as standard. At the end of 1972 (1973 model year) a low cost Saab fitted with plain wheels, a 1.85 litre engine and seats from a V4 was produced specifically for the Scandinavian markets. Conversely, Saabs destined for the other side of the Atlantic became increasingly luxurious. The 1974 model year’s sensation was the new Saab 99 Combi Coupe, a hatchback with the load-lugging characteristics of a Station Wagon or Estate car. With a high opening rear door that extended some 184cm from roofline to bumper, the new rear had excellent aerodynamics. The Combi Coupe was also known as a Wagonback in the United States market. The 99 had new front seats with integrated head restraints – with optional cushions for the centre sections. Head restraints had been an option since 1969 but were now fitted as standard, except in the US where they had been standard since 1969. Inside the 99 benefitted from improved heating and ventilation, the door skins were moulded from impact absorbing materials and the EMS gained a central armret on the rear seat. Improvements to the braking and exhaust systems and a redesigned and reinforced chassis were the major changes for this model year. All 99 models now had the 1,985cc 100hp engine and the fuel tank capacity was increased to 55 litres. From February 1975 a twin Zenith-Stromberg carb engine was available pushing out 108hp. The basic 99 X7 model was now known as just 99; the 99 EMS was now equipped with Bosch mechanical continuous injection (CI), which meant that the engine would deliver 118hp. Four models made up the 99 range for 1976. The 99L – a two door saloon and the 99GL – a two/four door saloon or a three/five door hatchback. The 99EMS – a two door saloon with a superior specification and the the 99GLE which came later in the model year. Revisions for the model year included improvements to the clutch, wider wheel rims, a long overdue electrically heated rear screen and improved dip-beam headlamps. At the Brussels Salon of Spring 1976 Saab introduced the 99GLE – a four door saloon with a fuel injected engine (118hp – same as EMS), automatic transmission and power steering. Double extra headlamps, a heated passenger seat, rear view mirrors adjustable from the inside and tinted windows completed the higher specification.